Perfectly tender, warm lemon zucchini muffins that would be great with a mug of hot tea or coffee. Smear on a little butter and enjoy! I’ve got the post long weekend blues! It’s been a super chilly week here in Houston. The temps dipped below freezing, and for me, that means. 1) a big pot of warm chili  or a pot roast  2) a fire burning in the fireplace and 3) a baking project. This weekend all I could think about were warm muffins. Something wintery tasting but speckled with fruit, berries, or veggies. I finally settled on warm lemon zucchini muffins. They’re heavily adapted from the blueberry muffins  that I’ve shared with you in the past, only this time, I swapped the blueberries for a heaping cup of grated zucchini and the buttermilk for a homemade version. My grocery store seemed to be out of buttermilk. But I feel that it ended up working out better this way. So much lemony goodness here! 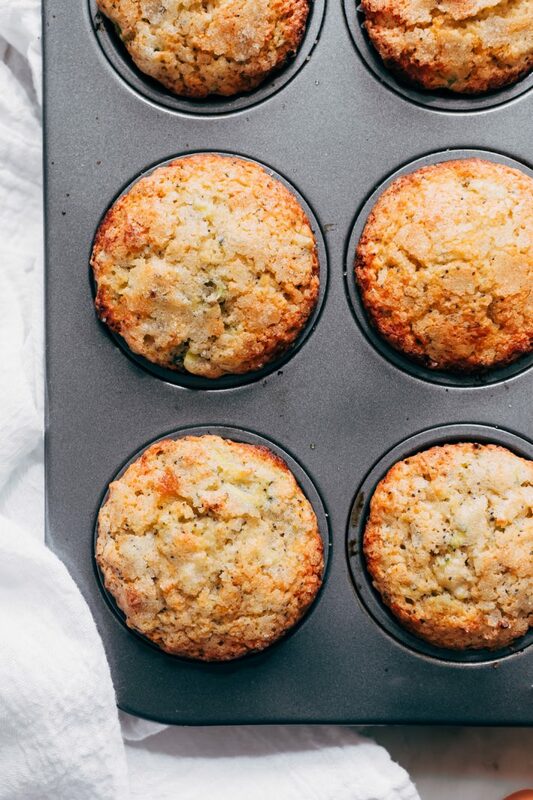 These zucchini muffins are sure to make the whole crew happy! This isn’t the first time I’ve made zucchini muffins. There’s a chocolate chip version  on the blog as well. However, over the years, my tastebuds have seemed to back off from chocolate-flavored-everything. Don’t get me wrong; there are still sporadic chocolate cravings that pop up out of nowhere. See my mocha almond cups  or my Nutella pie  for further proof. As I get older, I find myself wanting something that pairs better with a cup of coffee in the morning or warm chamomile tea in the evening. 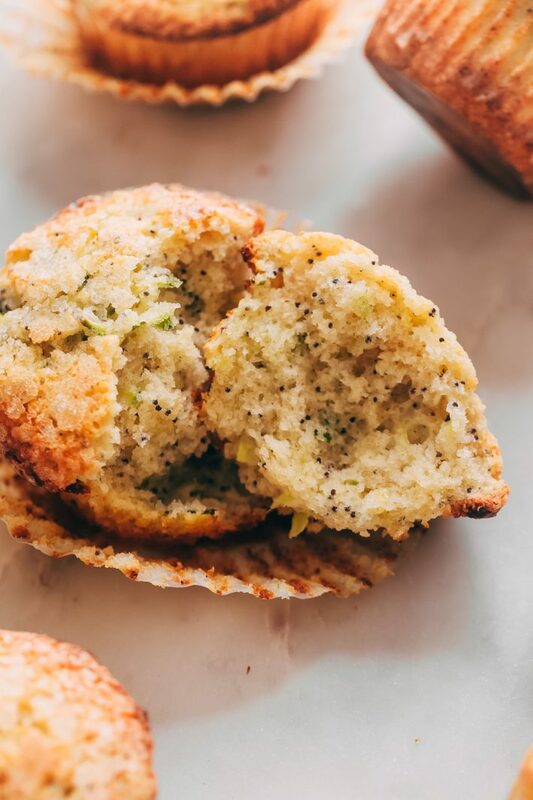 And these lemon zucchini muffins fit that craving perfectly. 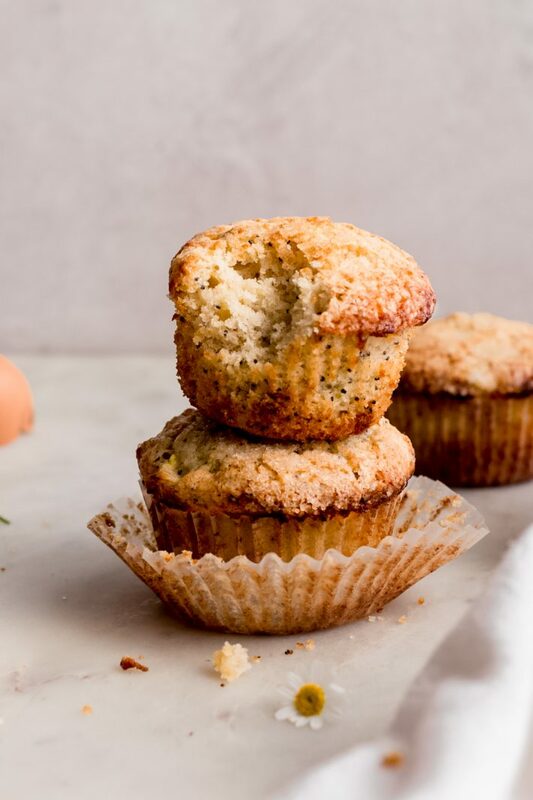 They’re warm and loaded with a few select spices, almond and vanilla extract, and last but not least, a generous sprinkling of freshly grated lemon zest. Here’s a tip, whenever you use lemon zest in a recipe, grate it directly over the sugar and then using just your fingertips rub the sugar and zest together. Just that little step makes a huge difference regarding lemon flavor! Now of course, since we’re creaming the butter and sugar together in this recipe, I didn’t shove my fingers in there. I just let the hand mixer do the job for me! 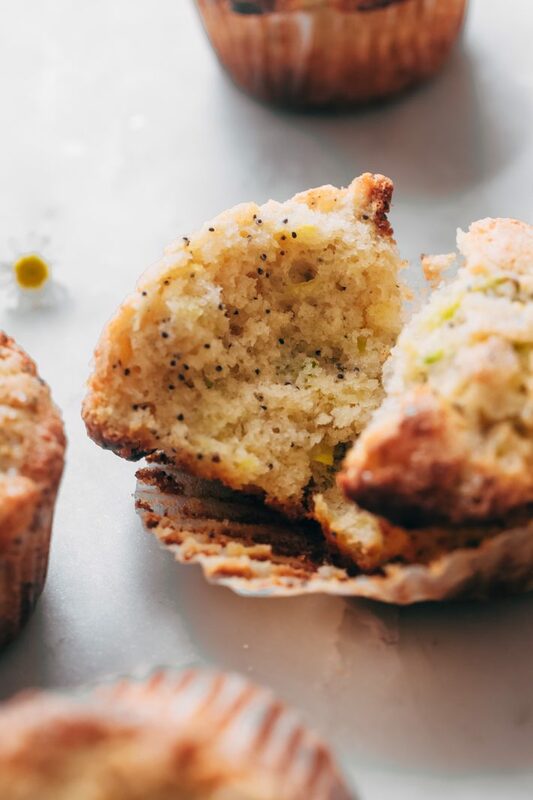 WHAT INGREDIENTS DO YOU NEED TO MAKE WARM LEMON ZUCCHINI MUFFINS? 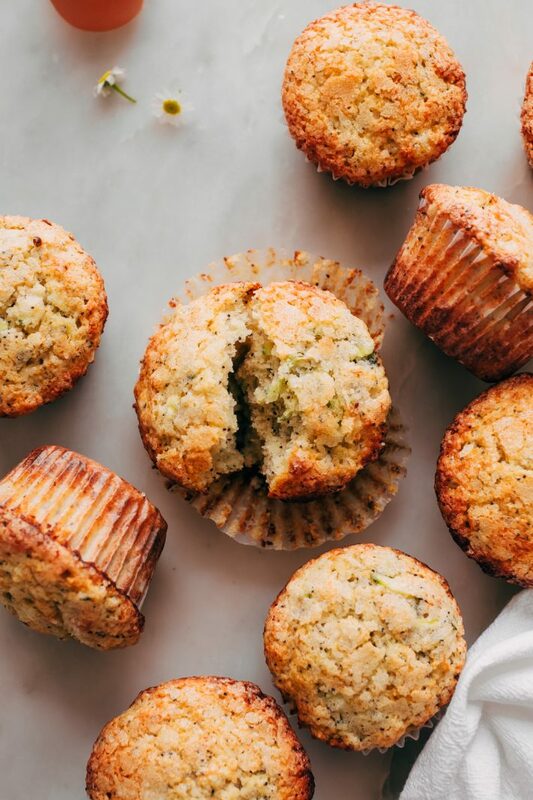 One ingredient that really sets these zucchini muffins apart from other recipes is the almond extract  (affiliate link) is an ingredient that I often use when making muffins. Up until recently, I wasn’t the biggest fan of this stuff. To tell you the truth, I still reserve almond extract for just a few select muffins, but zucchini muffins make that list. It elevates the flavors and gives it more of a bakery-style quality! A local brunch joint here in Houston makes a zucchini load that is just to die for. I’m pretty sure they add a hint of almond extract to it because these muffins taste really similar to their loaf. Combine the milk and the lemon juice in a measuring cup and allow the mixture to sit for 5 minutes. 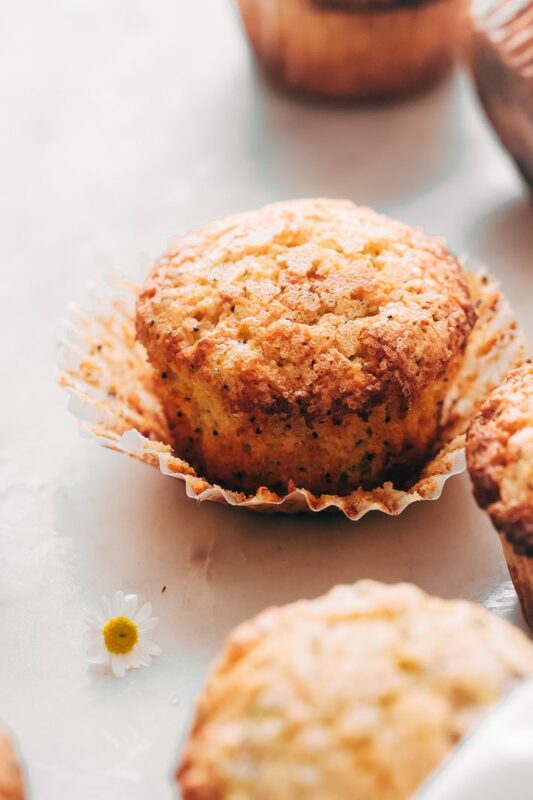 Doing so will make homemade buttermilk and add more of that lemon flavor to these muffins. Of course, if you’ve got buttermilk in the fridge, feel free to use it in place of my homemade version! The acid in the ’buttermilk’ helps these muffins rise nice and high! HOW DO YOU GRATE THE ZUCCHINI? Place a cutting board down. Rinse your zucchini, you’ll need one smallish zucchini and a grater. I use the coarse side of my grater  (affiliate link.) Grate the zucchini then place it in a sieve set over a bowl (or your sink) and allow any excess liquid to drip through. 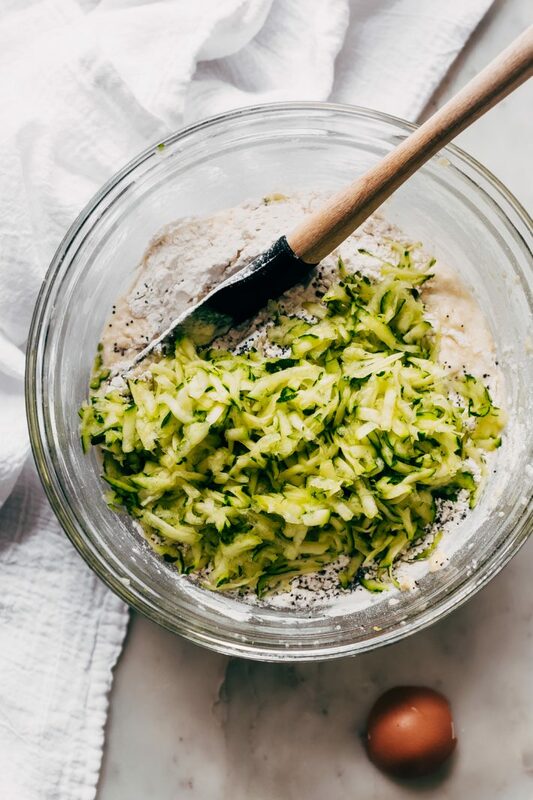 If your zucchini is particularly watery, give it a good squeeze before adding it to the muffin batter. Start by combining the dry ingredients in a bowl. Cream the butter and the sugar together and add the eggs one at a time. Then the extracts. Alternate the buttermilk and the flour until everything is combined. Fold in the poppy seeds and the grated zucchini. Sprinkle the remaining sugar over the muffins and bake. You want to mix the ingredients until they’re just barely moistening the dry ingredients. I know, when you see those small lumps of dry batter, you want to keep stirring until smooth, it’s human nature, but don’t! Over mixing the batter will create too much gluten production leaving you with a tough or dry muffin. Not what we want! WHY DO WE SPRINKLE THE SUGAR ON TOP? The sugar on top gives these muffins a distinct color and crunch. So addicting that way but you can certainly omit it if you’d rather keep it simple. DO I HAVE TO USE POPPY SEEDS? No, you don’t! You can simply omit them from the recipe or swap them for chia seeds to pack on a little more nutrition. Totally your call! 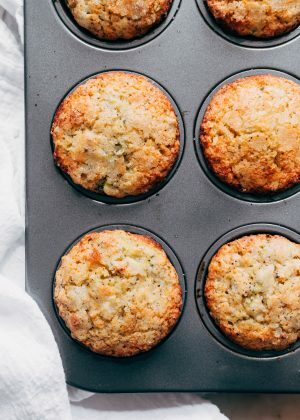 I FOLLOW A GLUTEN-FREE DIET, CAN I STILL MAKE THESE LEMON ZUCCHINI MUFFINS? Yes, I think it should work! I haven’t tried it with these zucchini muffins, but I have with my blueberry muffins, and it works perfectly. I’m confident it should with this one too! 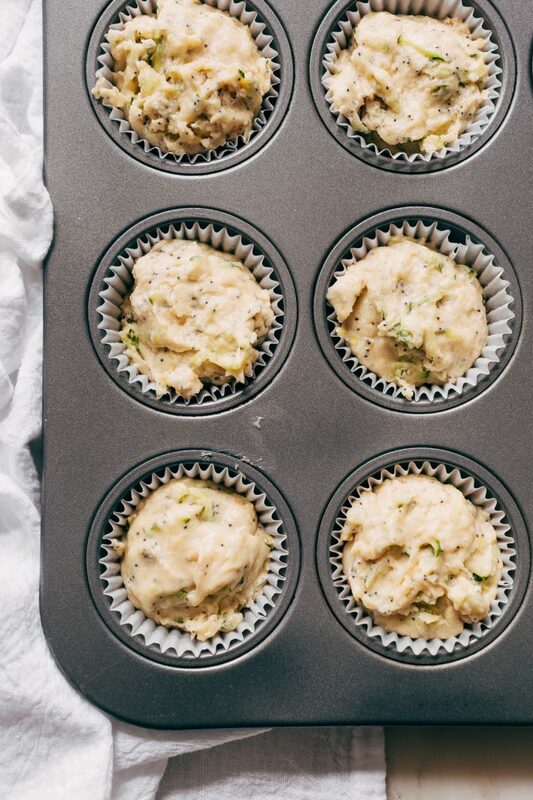 WHAT’S THE BEST WAY TO STORE THESE LEMON ZUCCHINI MUFFINS AND HOW LONG DO THEY LAST? These muffins will last a few days if left on the counter in an airtight container. However, I have my doubts you’ll have any left to preserve them! Yes, you can! Just bake them, allow them to cool to room temperature. Then, place them in a freezer zip top bag (or box) and freeze them for up to 3 months. Allow them to defrost in the refrigerator overnight or pop them in the microwave straight from the freezer for roughly 20-40 seconds. PREP: grate the zucchini and place it over a sieve to allow any excess liquid to drip out. Position a rack in the center of the oven and preheat the oven to 425ºF. Line muffin pan with paper baking liners and set aside. DRY INGREDIENTS: In a medium bowl, whisk together the flour, baking powder, salt, cinnamon, and nutmeg; set aside. BAKE: Divide the batter into the prepared muffin pan. Sprinkle the muffins with the remaining 2 tablespoons of sugar. Place the muffin pan in the oven and bake for 4 minutes. Then, drop the temperature to 375ºF. Bake the muffins for 18-22 minutes or until the muffins are done when tested with a toothpick. Cool for a few minutes in the pan then transfer to a wire rack to cool completely. combine the milk and lemon juice and let it sit for 5 minutes before you add it at the end of step 3.
if you have unsalted butter, just up the salt to ½ teaspoon total. leftover muffins can be stored in an airtight container for 2 days and kept at room temperature. You can also pop these into a zip top bag and freeze them for later.